Nestled in the bluffs of the Town of LaFayette, between Eau Claire and Chippewa Falls WI, surrounded by nature's beauty and the quiet tranquility of forests and apple orchards, White's Wildwood Retreat is a one-of-a-kind destination for your wedding. The possibilities are limited only by your imagination. Our lodge and cabin can comfortably accommodate 33 overnight guests — a perfect venue for your wedding party and out-of- town guests. White's Wildwood Retreat is your blank canvas on which you can create your dream wedding. 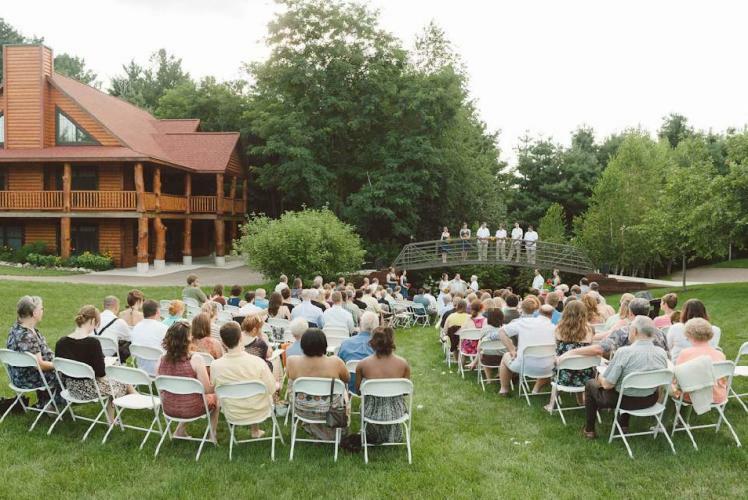 Our outdoor ceremony area is a natural, grassy amphitheater culminating at a rustic bridge that can be used as a picturesque backdrop or to hold your wedding party. We offer flexibility in all areas, from catering and beverages to decorations. You may choose to have your wedding in a grassy aisle under a canopy of blue sky and golden sunshine or a romantic walk through the wooded countryside — the possibilities are endless. Continue your outdoor wedding celebration with a reception held under a giant 48'x90' pavilion, or if you prefer, move indoors to the Wildwood Lodge. After dinner, dim the lights and set the mood for the dance. There are 62 interior LED lights set up in eight zones, all on dimmer switches. The inside perimeter has switched outlets every eight feet if you would like to add accent lighting. The pavilion can accommodate up to 400 guests. The great room of the lodge offers comfortable seating for your wedding guests who just want to relax in quiet conversation while others dance the night away outside. And when the music stops, reserve the Wildwood Lodge or Cabin for your family or wedding party to stay the night. The Lodge offers accommodations for 21 people, the Cabin for 12. Your wedding guests will enjoy the charming rustic luxury of the rooms and thank you for your thoughtfulness. It's the perfect way to end your wedding reception.